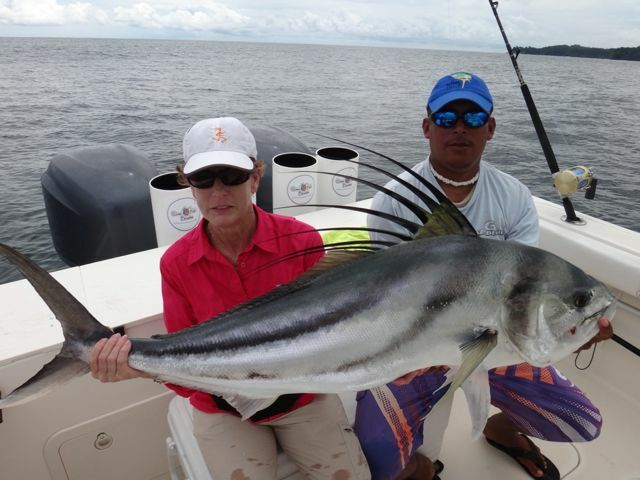 Wahoo, Tuna, Roosterfish, African Pompano and more..
Offshore sports fishing this week with Come Fish Panama were John and Laura from San Antonio, Texas. These anglers were excited to final wet a hook and expressed an interest in targeting Roosterfish, Yellowfin Tuna and Marlin. 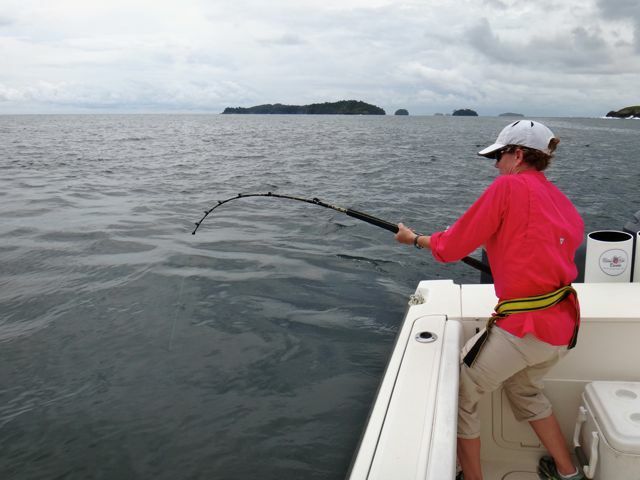 Although we are not at the peak of Marlin season, some hang around all year as long as the bait remains in the area. Our plan was to dedicate a few hours during their 2-day trip with the hope of raising one and better yet, hooking one. Tropical rains finally arrived so it was in and out of rainstorms during our days out at sea. The water clarity was fair to good with water temperature on the cool side. Heading due South to Isla Montuosa, we started our day trolling for some Bonito to be used for bait. 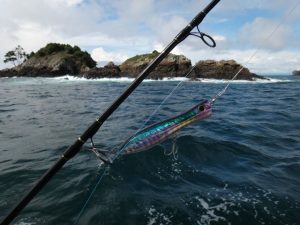 We also deployed a couple of Wahoo lures just in case one was lurking around, and I’m glad we did. About 15 minutes later, one of the speedsters caught up with a lure and lined peeled off the reel. 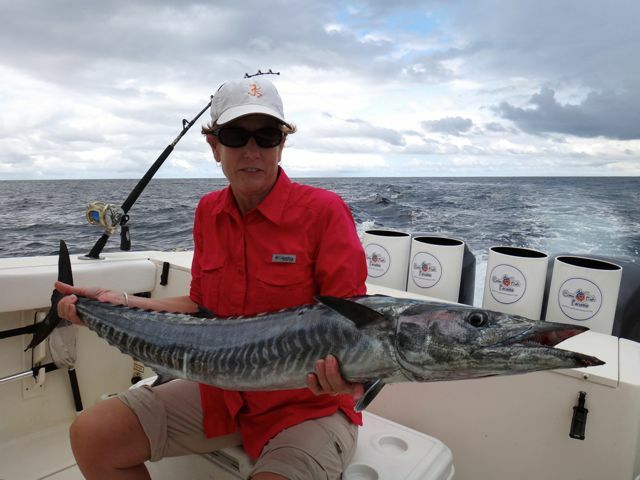 Laura picked up the rod and worked the beautiful Wahoo back to the boat and finally onto the fish box. We caught many Jack Crevalle but only one Bonito, so we decided to do some bottom fishing around the island. After 30 minutes of unsuccessfully trying to get our Blue Runners down, we concluded that the marauding Porpoises were going to continue to steal our bait on every drop. We noticed birds and Porpoises, along with a Humpback Whale, working an area so we pointed the bow of the “Sweet Leilani” in that direction. As we got closer to the action, we could see Yellowfin Tuna busting on the surface, so our excitement grew with every minute that passed. Once we got within casting distance of the melee, we tossed out a live Blue Runner and bang, “fish on”. 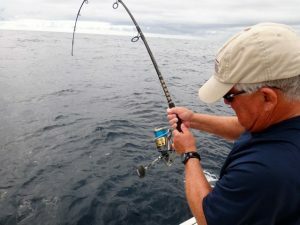 The spinning reel screamed for a bit, but then it went silent when another Yellowfin cut the line. It took a couple more attempts before John was hooked up to a nice Yellowfin Tuna. Once the fish was in the box we raced off through a tropical rainstorm towards Isla Secas where we found sunshine once again. 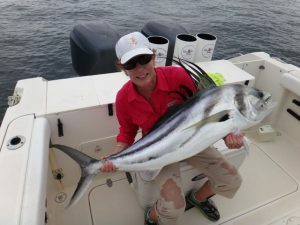 This turned out to be a good move as Laura and John had a blast catching a monster Roosterfish, African Pompano, Bluefin Trevally, Barracuda, Needlefish and a Cubera Snapper. 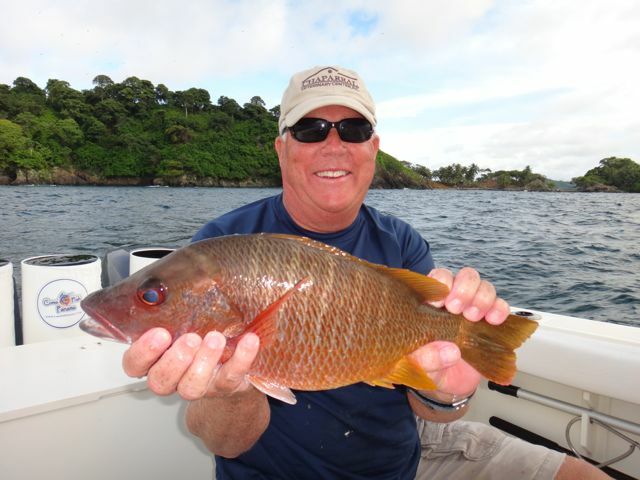 Come Fish Panama would like to thank John and Laura for joining us this week. I am happy that they were able to get 2 of 3 species on their wish list especially that Big Roosterfish. I hope you enjoy the action photos below. 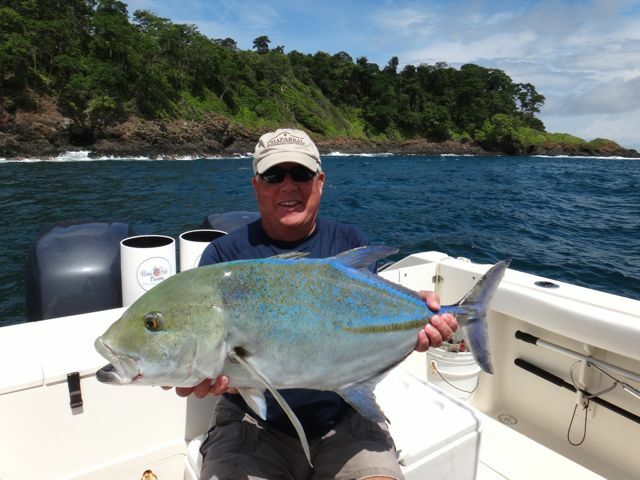 Our 2014 calendar prime season dates are starting to fill up, so contact us soon to reserve your next fishing adventure in Panama.